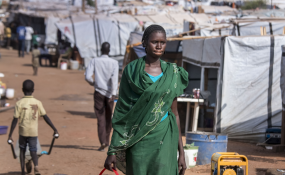 Internally displaced person camps, like this one in Juba, were established across South Sudan following the eruption of civil war in December 2013. Talks between President Salva Kiir and former First Vice President Riek Machar in the Sudanese capital Khartoum offer the only, albeit slim, hope of a breakthrough in South Sudan's brutal civil war. African leaders should offer cautious support during the Nouakchott AU summit. On 27 June 2018, South Sudanese President Salva Kiir and former First Vice President Riek Machar, the principal adversaries in South Sudan's civil war, signed a Declaration of Agreement in Khartoum. The declaration does not resolve major points of contention between the two leaders, deferring them to talks which are ongoing in the Sudanese capital. Moreover, nearly five years of mediation and a 2015 peace deal have failed to end South Sudan's brutal civil war. Circumspection as to whether the Khartoum negotiations can do so is thus warranted. But for now, those talks offer the only hope, however slim, of a breakthrough. The African Union's Peace and Security Council, and the leaders of Algeria, Chad, Nigeria, South Africa and Tanzania, who have been involved in past rounds of negotiations, should use their meetings on 30 June in Nouakchott, Mauritania to lend the Khartoum talks cautious support, while laying out clearly what they expect from next steps and the measures they would take against parties obstructing progress. The 27 June Khartoum Declaration, brokered by Sudanese President Omar al-Bashir, has three primary objectives. First is a "permanent ceasefire", coming into effect on 30 June. This will be monitored by the parties themselves, with African forces invited to "supervise" it. Secondly, the parties promised to sign a "Revised Bridging Proposal" to form a new transitional government and revise security arrangements defined in the last peace deal, the 2015 Agreement on the Resolution of the Conflict in the Republic of South Sudan. This bridging proposal sets the stage for a three-year transitional period; negotiations in Khartoum over its provisions are proceeding on the basis of a draft circulated by the Intergovernmental Authority on Development (IGAD), the Horn of Africa regional body leading mediation efforts. Thirdly, the declaration provides for Sudan to work "in collaboration and coordination" with its southern neighbour to secure and rehabilitate oil fields in the former Unity state. Nearly five years of mediation and a 2015 peace deal have failed to end South Sudan's brutal civil war. Machar, who has been allowed to leave his nearly two-year confinement in South Africa for the talks, hopes to assume his prior position as first vice president. The government rejects his return to South Sudanese politics. The deal reportedly on offer for Machar is the freedom to live in another African country but stay out of South Sudan, while his Sudan People's Liberation Movement/Army - In Opposition (SPLM/A-IO) faction would enjoy representation in the new cabinet and other transitional bodies. IGAD has not communicated its final position with regard to Machar. There are good reasons to regard the declaration with scepticism. The last cessation of hostilities between the parties, which was endorsed by both Kiir and Machar in December 2017, broke down quickly. Moving from the declaration's vague terms to details on transitional arrangements and power-sharing will be no small feat. Parties could easily revert to their previously deadlocked positions. Machar himself would need to be compelled to relinquish his political role in South Sudan; thus far he has rejected doing so. Other opposition leaders would need to believe the agreement served their interests and that they cannot hold out for a better deal hoping that IGAD leaders' positions change or U.S. antipathy towards Kiir, which has been growing, works in their favour. For his part, Kiir and his supporters still need to grant a share of power to their rivals and accept rebels' integration into the security forces on terms that are similar to those they have rejected in the past. Even were the parties to reach a more comprehensive deal on paper, enforcing their compliance in practice would likely prove an uphill struggle. Moving from the [Khartoum] declaration's vague terms to details on transitional arrangements and power-sharing will be no small feat. That said, Bashir's mediation, endorsed by other IGAD leaders, counts several points in its favour. The threat of a UN arms embargo and UN and AU sanctions against South Sudanese leaders if talks fall apart hangs over the parties. IGAD's impatience with those leaders is mounting, as is pressure from other African leaders and donors on the regional body to secure a deal. Clear economic dividends for the South Sudanese parties are on the table, namely the revenue from renewed oil production and, potentially, from improved foreign relations; indeed, the agreement with Sudan on the oil fields played a large part in motivating the parties to sign the declaration. Lastly, China, which enjoys leverage as South Sudan's most significant economic partner, would benefit from the declaration's provisions on oil production, providing parties further incentive to reach and honour an agreement. The Khartoum declaration and the negotiations ongoing in the Sudanese capital leave much room for doubt. Many South Sudanese would prefer a deal that reflects their aspirations rather than divvying up power and resources among those most responsible for the war plaguing their country. But, at least for now, there is no viable alternative. The choice is not between this process and a better one, but between it and none at all. Besides, while the broad contours of a deal - power sharing between warring groups - are clear, the Khartoum declaration's ambiguous language means the AU and those African leaders involved in the mediation may still be able to shape a settlement that serves the interests of South Sudan's population by reducing the instability and violence wracking their country. The Khartoum talks offer at best a slender hope, but one that the AU and African leaders should pursue. South Sudan - Will the New Peace Deal Last?